The proposal by geophysicists at the University of California, Berkeley, links the existence of oceans early in Mars history to the rise of the solar system's largest volcanic system, Tharsis, and highlights the key role played by global warming in allowing liquid water to exist on Mars. "Volcanoes may be important in creating the conditions for Mars to be wet," said Michael Manga, a UC Berkeley professor of earth and planetary science and senior author of a paper appearing in Nature this week and posted online March 19. Those claiming that Mars never had oceans of liquid water often point to the fact that estimates of the size of the oceans don't jibe with estimates of how much water could be hidden today as permafrost underground and how much could have escaped into space. These are the main options, given that the polar ice caps don't contain enough water to fill an ocean. 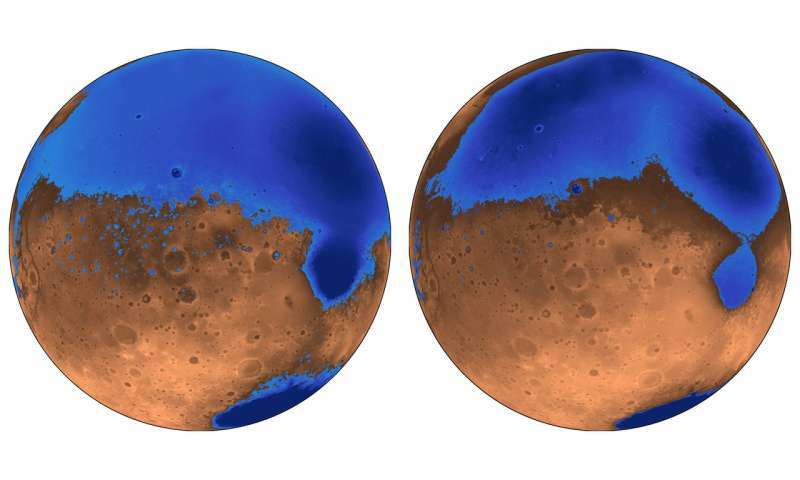 The new model proposes that the oceans formed before or at the same time as Mars' largest volcanic feature, Tharsis, instead of after Tharsis formed 3.7 billion years ago. Because Tharsis was smaller at that time, it did not distort the planet as much as it did later, in particular the plains that cover most of the northern hemisphere and are the presumed ancient seabed. The absence of crustal deformation from Tharsis means the seas would have been shallower, holding about half the water of earlier estimates. "The assumption was that Tharsis formed quickly and early, rather than gradually, and that the oceans came later," Manga said. "We're saying that the oceans predate and accompany the lava outpourings that made Tharsis." It's likely, he added, that Tharsis spewed gases into the atmosphere that created a global warming or greenhouse effect that allowed liquid water to exist on the planet, and also that volcanic eruptions created channels that allowed underground water to reach the surface and fill the northern plains. This irregularity could be explained if the first ocean, called Arabia, started forming about 4 billion years ago and existed, if intermittently, during as much as the first 20 percent of Tharsis's growth. The growing volcano would have depressed the land and deformed the shoreline over time, which could explain the irregular heights of the Arabia shoreline. Similarly, the irregular shoreline of a subsequent ocean, called Deuteronilus, could be explained if it formed during the last 17 percent of Tharsis's growth, about 3.6 billion years ago. "These shorelines could have been emplaced by a large body of liquid water that existed before and during the emplacement of Tharsis, instead of afterwards," said first author Robert Citron, a UC Berkeley graduate student. Citron will present a paper about the new analysis on March 20 at the annual Lunar and Planetary Science conference in Texas. Tharsis, now a 5,000-kilometer-wide eruptive complex, contains some of the biggest volcanoes in the solar system and dominates the topography of Mars. Earth, twice the diameter and 10 times more massive than Mars, has no equivalent dominating feature. Tharsis's bulk creates a bulge on the opposite side of the planet and a depression halfway between. This explains why estimates of the volume of water the northern plains could hold based on today's topography are twice what the new study estimates based on the topography 4 billion years ago. "This is a hypothesis," Manga emphasized. "But scientists can do more precise dating of Tharsis and the shorelines to see if it holds up." NASA's next Mars lander, the InSight mission (Interior Exploration using Seismic Investigations, Geodesy and Heat Transport), could help answer the question. Scheduled for launch in May, it will place a seismometer on the surface to probe the interior and perhaps find frozen remnants of that ancient ocean, or even liquid water. Much like the Moon, the crust of Mars is an unconsolidated rubble pile, due to LHB and no active crustal processes (tectonics) since that time. Mars' water has drained into the porous crust and remains there both in a frozen and liquid state.